To add an active control, you need to insert a new control to the layout and configure it as an active control on the Parameters tab. Selecting active report as the control type creates an association between the HTML Composer control and an active report, thereby linking actions to directly affect bound active reports. Only when there are active reports embedded or referenced in HTML Composer, are active controls applicable. An active control cannot be associated to any parameters in the layout. This type of control can only be associated with an active report in the Layout. An active report that has a password (ARPASSWORD) set for viewing restrictions is not supported in an active dashboard created with HTML Composer. When creating active dashboards in HTML Composer, the combination of using an active report with the active cache option enabled and using an active control that is a Date field (such as dates with format MDY and MDYY) results in an error. The active control date field works correctly if you deselect the active cache option in the active report. If a control displaying report types appears in an AHTML report in HTML Composer, and the Pivot report type is selected at run time, the report is incorrectly reduced in size. If the user selects Pie, Chart, Line, or the default report type of Grid, the frame is not resized to the original positioning set by the user. Although scroll bars are added, output cannot be fully viewed. Any HTML Composer control can be configured as an active control, but the following controls are the most applicable: Check box, Drop down list, List box, Radio button, and Push button. Select the control type (for example, Drop Down List or List Box) from the Components or Controls submenu of the Insert menu. Drag the crosshair to create a control object and adjust it to the size you want. The HTML Composer control is added as the active control. You can now configure the control by using the Parameters tab. The Properties and settings dialog box appears when creating or editing an active report value on the Parameters tab. The following image is the Properties and settings dialog box with an active report Data type. Determines whether values are obtained from a static or dynamic list, an active report, or TOC. Selecting active report will require you to bind the HTML Composer control to an active report. 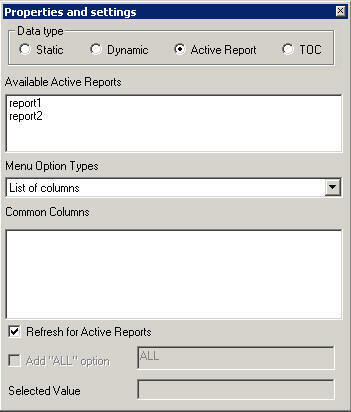 The Available active reports list binds active controls to active reports in the layout. At run time, when the Refresh for active reports setting is triggered, the active reports selected in the Available active reports list are modified based on the current state of each active control it is bound to. Available active reports lists all active reports currently embedded in HTML Composer. No active reports are selected by default. The Menu Option Types determine how active reports are modified when the Refresh for active reports setting is triggered. Menu Option Types configure active controls to sort columns, filter content, and change the active report presentation. Multiple active controls, each with different Menu Option Types settings, can be used in combination to modify the active dashboard. Menu Option Types presents a list of options to designate which active report menu option an active control inherits. To set the behavior of the current active control, select only one Menu Option Types item. If no option is selected, the active control has no effect on the active dashboard. At run time, the active control lists all common columns found in each bound active report. When the Refresh for active reports setting is triggered, the data is sorted by the selected column. If using AS Names for a field in a report, all common columns must have the same name across all reports. 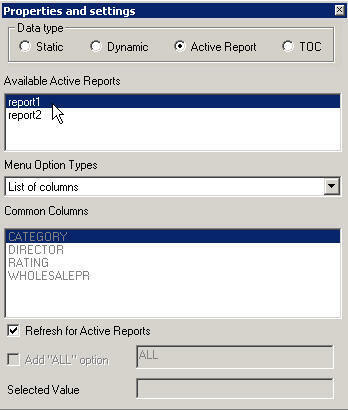 At run time, the active control lists all unique values found in a specified column, common in each bound active report. When the Refresh for active reports setting is triggered, the active control filters bound active reports based on the column value selected. The Add "ALL" Option is activated when the Column value option is selected. This adds the option to select ALL data source values to the control. At run time, the active control lists multiple filtering actions. This type of control does not affect bound active reports by itself, but only when used in conjunction with active controls set to Column Value. When the Refresh for active reports setting is triggered, the active control instructs how to filter bound active reports based on the value selected in the Column Valued control. 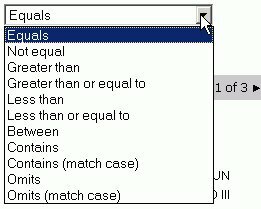 The available list of filters is: Equals, Not equal, Greater than, Greater than or equal to, Less than, Less than or equal to, Between, Contains, Contains (match case), Omits, and Omits (match case). At run time, the active control lists two sorting actions, Sort Ascending and Sort Descending. When the Refresh for active reports setting is triggered, the active control sorts bound active reports based on the sorting action selected. By default, the active control sorts the first common column in each of the bound active reports. At run time, the active control lists different active report presentation types; Grid, Pie Chat, Line Chart, Bar Chart, and Pivot Table. When the Refresh for active reports setting is triggered, this active control changes bound active reports to the presentation type selected. The Common Columns list only appears when the Column value Menu Option Type is selected. Common Columns lists all common columns found in each bound active report. Select one field to bind to the active control. At run time, the Column value control lists all unique values across each bound active reports Common Columns field selected. The Common Column selection can be overridden at run time when the Column Value control is chained to the List of columns Menu Option Type. Enables active controls to automatically modify current views of bound active reports when you select a new value at run time. 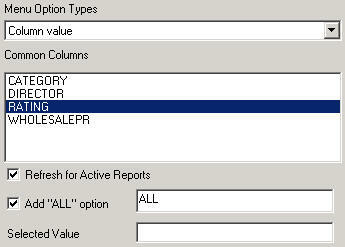 Refresh for active reports is enabled by default when you select an Available active report from the Parameters window. For more information about the Refresh for active reports option, see Refreshing Active Technologies Reports. Enter the values to be selected as the default value whenever the procedure is run. The Selected Value option is only available for active controls when the Column Value Menu Option Type is selected. Adds the option to select ALL data source values to the control. Alternate text can be substituted for "ALL" using the text field to the right. The Add "ALL" Option is available when the Column value option is selected from the Menu Option Types. Once the active control is added to the layout, you can configure it by using the Properties and settings dialog box on the Parameters tab. It is important to note that you can only chain List of columns to List of column values. Select the active control in the layout and click the Parameters tab. The Properties and settings dialog box opens. Select active report as the Data type. Select one or more active reports from the list of Available active reports. When an active report is selected, Refresh for active reports is enabled by default. The active reports selected in the Available active reports list are modified based on the current state of each active control it is bound to. Refresh for active reports refreshes current views of bound active reports when you select a new value at run time. Select the Menu Option Types for the active control to sort, filter, list or select columns, and/or change presentation styles of the bound active report and the associated report and graph objects synchronized to the active report. Select List of columns from Menu Option Types to list all common columns found in each bound active report. At run time, the bound active report output is sorted by the selected column. For example, the following active control shows a list of all the columns in the bound active report. 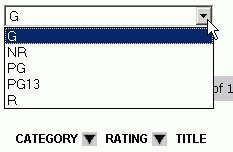 Select the Column value option from the Menu Option Types to list all unique values found in a specified column, common in each bound active report at run time. Note: You can only chain List of columns to Column value. You cannot chain a Column value to another Column value. When the Column value option is selected, the active control panel dynamically presents Common Columns in each of the selected active reports in the Available active reports list. Select one column from the Common Columns list. You can also use the Selected Value field to enter the values to be selected as the default value whenever the procedure is run. The Add "ALL" option adds the option to select ALL common column values to the control at run time. For example, the following active control shows RATING as the selected common column for the bound active report. Select List of filters from the Menu Option Types to list multiple filtering actions at run time. List of filters is used in conjunction with the Column value. Both controls should be bound to the same active reports. The active control instructs how to filter bound active reports based on the value selected in the Column value control. For example, the following active control shows a list of filters in the bound active report. Select Sort order from the Menu Option Types to list sorting options (Ascending or Descending) at run time. The active control sorts bound active reports based on the sorting action selected. For example, the following active control shows list sort order options in the bound active report. Select the Report types option from the Menu Option Types to list different active report presentation types at run time. The active control changes bound active reports to the presentation type selected. For example, the following active control shows report type options in the bound active report.